SAFARI Montage Basics Training FREE! 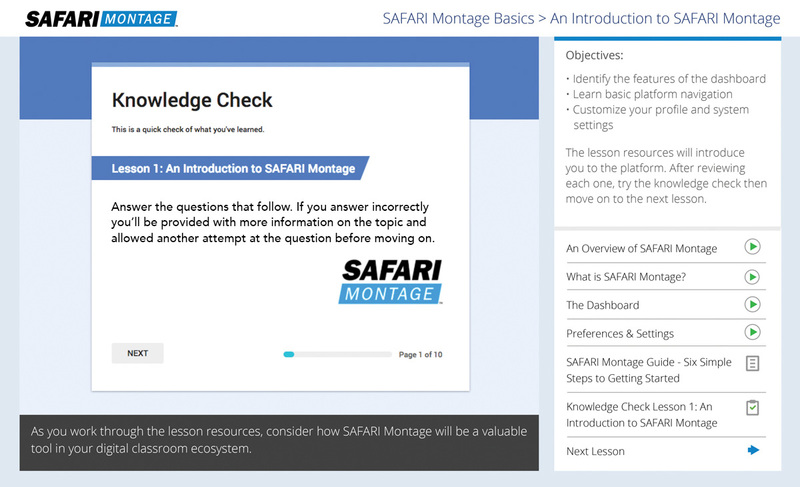 This free self-paced, video-based online training is available to LOR customers, and is designed for users who are new to SAFARI Montage or just need a review. This series of 7 lessons should take approximately 2 hours to complete and is ideal for getting all users engaged with the platform and enables users to earn a SAFARI Montage badge upon successful completion. Requires SAFARI Montage Version 6.5+ and Learning Object Repository (LOR) or Interoperability Support Services (ISS) subscription. For more information on SAFARI Montage Professional Development services available, please contact us at PD@SAFARIMontage.com or call 800.843.4549.